questions about the work at those very same mags. S.F: Tell the readers a bit about what you've done for Sega/Saturn Power in the past? D.M: I started on Sega Power in July 1992, after beginning my gaming career at Paragon Publishing. S.F: What are you doing these days? features. I keep busy and still love my job. S.F: Which of the Sega power/Saturn people that you worked with are you still in contact with? D.M: Not many, sadly. Nick Merritt (old Sega Power editor) is, currently, about 20 feet away from me. a very well-known comedy writer in the UK! 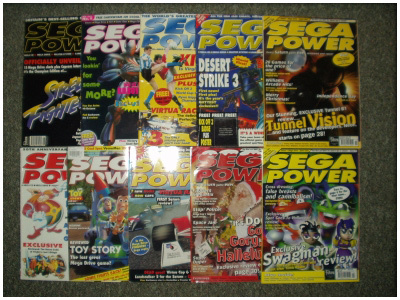 Sega Power ran for over seven years and spawned 91 issues. S.F: Can you tell us what the work at those magazines was like? What were the best/worst parts? at Future, but even towards the end we had lots of fun. on Sega power for six or so years. S.F: Is the rest of the Saturn power team still working in the same office? D.M: No. Lisa Kellett works in a different division (still at Future, though). James Price is another freelancer. James Ashton is a publisher in London for Future's Xbox titles. with a software key disc and a ‘Test’ PS2. All quite rare, I guess, but only really useful if you’re in the industry. 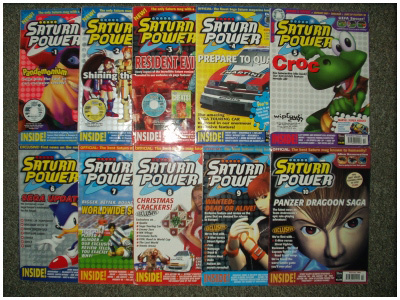 The total amount of issues (10) that Saturn Power lasted for. what you think of Richard Leadbetter and SSM today? balances it out! The rivalry was mostly harmless fun… or was it? D.M: Not much, to be honest. If it was any good, then the chances are that it made it out to the shelves. developers couldn’t get the MD version signed. It was a shame, as the game was actually quite good. Interesting fact, though: the developer’s PR person was Andy Smith, another old Sega Power editor. unreleased, can you tell us how those situations ended? it was much better than Reloaded. S.F: Any interesting tidbits/insider info/useful knowledge you'd like to share? he’s worked a lot with Dave Gorman. S.F: What are your top 5 SEGA and your Top 5 Non SEGA games these days? any copies of Sega Power at Future any more and I’ve got surprisingly few copies myself.